This Cape Winelands Guide to the town of Paarl in the Western Cape, South Africa suggests a variety of highlights, activities and Paarl accommodation options. A pearl in the Drakenstein Valley, the historic town of Paarl in the Cape Winelands is the home of world-class red wine and brandy in South Africa. Well known names such as KWV and Nederburg are internationally recognised, but there are many excellent wineries here, both young and old, making outstanding vintages.Paarl is one of the oldest towns in South Africa, a traditional favourite in the Cape Winelands with beautiful scenery, architecture and cultural heritage. The long main road through the town is lined with massive Oak trees and fabulous buildings representing Cape Dutch, Edwardian, Victorian and even Art Deco styles.The Red Route in the Cape Winelands is a delightful meander through the picturesque Paarl Valley with plenty of wine tasting opportunities along the way. This area specialises in Cabernet Sauvignon and Shiraz, but these days a very diverse selection of wines is produced. Visitors on a self-drive holiday can also simply venture out and make their own discoveries amongst the 50 or so wine farms and Paarl accommodation.This Cape winelands town stands on the Berg River at the foot of one of the largest granite outcrops in the world - Paarl Rock. 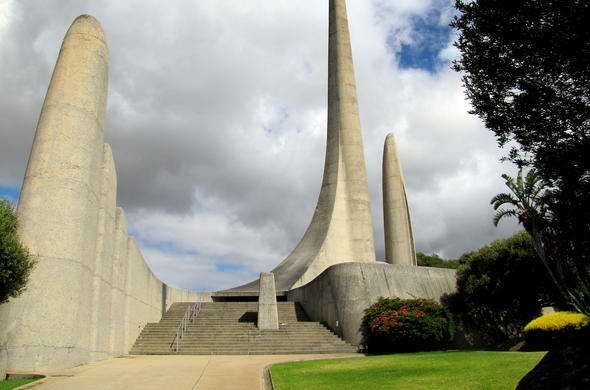 Standing proud on the mountain is the Afrikaans Language Monument. The mountain and surrounding nature reserve is very popular for walks and hikes, mountain biking, picnics and culture. Beautiful Paarl Valley and it's diversity of flora and fauna even attracted a visit from Charles Darwin in 1836.Paarl offers diverse Cape Winelands accommodation for every kind of traveller, from 5 star luxury lodges to self-catering cottages and everything in between. All year round visitors come to enjoy the magical surroundings and hospitality. Paarl is just 45 minutes drive from Cape Town and a delightful wine route holiday destination - let your Siyabona Africa Consultant book the perfect getaway.